Anastas Hovhannesi Mikoyan (Armenian: Անաստաս Հովհաննէսի Միկոյան) (November 25, 1895 - October 21, 1978) was an Armenian Bolshevik and Soviet statesman during the Stalin and Khrushchev years. In the Soviet Union, he is primarily known as Anastas Ivanovich Mikoyan (Russian: Анаста́с Ива́нович Микоя́н). Anastas Mikoyan joined the Bolshevik Party and fought in Baku during the 1910s against anti-Bolshevik figures. He supported Joseph Stalin after Vladimir Lenin's death created a power vacuum. During Stalin's reign, he was awarded several high governmental posts including Minister of Trade. He made several key trips to communist Cuba and the United States, acquiring an important stature in the international scene. He helped introduce the manufacture of canned goods after his trip to the U.S. He also used his connections to raise hard currency selling stolen art treasures. Having supported Stalin in the 1920s, after Stalin's death, he backed Nikita Khrushchev and his de-Stalinization policy. He was instrumental in the important "Secret Speech" at the 20th Party Congress in which Khrushchev denounced Stalin's "cult of personality." He helped Khrushchev to outmaneuver the Stalinist hardliners Vyacheslav Molotov and Georgy Malenkov. In 1964, Khrushchev was forced to step down in a coup that brought Leonid Brezhnev to power. Mikoyan's influence was retained under Brezhnev as he was appointed Chairman of the Presidium of the Supreme Soviet from 1964 until his retirement in 1965. Anastas Mikoyan was born in the Armenian village of Sanahin (now part of Alaverdi) in Russian Armenia, today in Armenia's Lori province. His father, Hovannes, was a carpenter and his mother was a rug weaver. Mikoyan graduated from the Nerseesyan Theological seminary in Tiflis, Georgia. He would later remark that his continued studies in theology drew him closer to atheism, "I had a very clear feeling that I didn't believe in God and that I had in fact received a certificate in materialist uncertainty; the more I studied religious subjects, the less I believed in God." In school, he had taken several courses on liberal and socialist principles which later interested him in the advent of leftist revolutionary movements in Russia. At the age of 20, he formed a workers soviet in Ejmiatsin. In 1915, Mikoyan formally joined the Russian Social Democratic Labor Party (later known as the Bolshevik Party) and became a leader of the revolutionary movement in the Caucasus. His interaction with Soviet revolutionaries led him to Baku, Azerbaijan where he was a co-editor for the Armenian language newspaper. Social-Democrat (Սոցիալ-Դեմոկրատ), and later for the Russian-language paper, Izvestia Bakinskogo Soveta (Известия Бакинскогo Сoвeтa). After the February 1917 revolution, which toppled the Tsarist government, Mikoyan and other Bolsheviks in the Caucasus fought in Azerbaijan; he and 26 other commissars were captured and put in prison. Known as the "Baku 26," all were executed with the exception of Mikoyan, with the circumstances of his survival shrouded in mystery. With the advent of the October Revolution, Mikoyan was made a commissar in the newly formed Red Army and continued to fight in Baku against anti-Bolshevik forces. He was wounded in this fighting and was noted for saving the life of fellow future Party member, Sergo Ordzhonikidze. In the same year, he was arrested by interventionist British troops in Baku, but was able to escape. Afterwards, he continued his Party work, and was one of the co-founders of the Baku soviet in 1919. 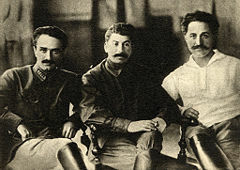 The Caucasus trio, Mikoyan, Stalin and Ordzhonikidze. Mikoyan supported Stalin in the power struggle that followed Lenin's death and was appointed to the Central Committee in 1923. He went on to become People's Commissar for External and Internal Trade in 1926, and imported ideas from the West, such as the manufacture of canned goods. In 1935, he was elected to the Politburo, and was among one of the first Soviet leaders to pay goodwill trips to the United States in order to boost economic cooperation. Mikoyan spent three months in the United States learning about its economic system and leaving it with favorable impressions. He was responsible for organizing the transport of food and supplies during the Second World War. His son, a pilot in the Red Air Force, was killed in combat when he was shot down by German fighters near Stalingrad. In 1942, he became a member of the State Defense Committee and for his war efforts, was decorated with a Hero of Socialist Labor in 1943. In 1946, Mikoyan became the vice chairman of the Council of Ministers. Shortly before Stalin's death, Mikoyan, Georgy Malenkov, and several other Party leaders were being considered for a new purge by Stalin, however this never came to fruition as the General Secretary died in 1953, before he could put the plan into motion. Mikoyan originally argued in favor of withholding Stalin's right hand man, Lavrenty Beria, from punishment but later gave in to popular support among Party members for his arrest. He remained in the government after Stalin's death, in the post of minister of trade, under Malenkov. He supported Khrushchev in the power struggle with Stalin loyalists, Georgy Malenkov and Vyacheslav Molotov to see who would succeed Stalin. He was made First Deputy Premier of the Soviet Union by the victorious Khrushchev in recognition of his services. In October 1956, Mikoyan was sent to Hungary to resolve the crisis caused by the revolution against the communist government there. He strongly opposed the decision by Khrushchev and the Politburo to use Soviet troops believing it would destroy the Soviet Union's international reputation, instead arguing for "military intimidation" and economic pressure to be applied towards Hungary's government. The crushing of the revolution by Soviet forces nearly led to Mikoyan's resignation. In 1957, Mikoyan refused to back an attempt by Malenkov and Molotov to remove Khrushchev from power, thus securing his role as one of Khrushchev's closest allies. His motivation for backing Khrushchev was because of his strong support for de-Stalinization and his belief that a triumph by the plotters might have given way to purges similar to the ones in the 1930s. During Khruschchev's reign, he continued to hold numerous other posts in the field of trade, and made a number of state visits to the U.S., Japan, and Mexico. He also retained the title of First Deputy Premier. 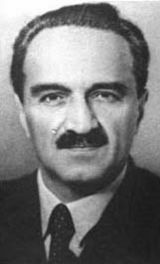 Mikoyan continued to hold moderate views on the Cold War and was unhappy with Khrushchev's brinkmanship over Berlin in the Checkpoint Charlie Crisis of 1961 and over Khrushchev's walk out from the 1960 Paris Summit over the U-2 Crisis of 1960, which he believed kept tension in the Cold War needlessly high for another fifteen years. Despite his concerns, he remained Khrushchev's closest ally in the upper echelons of the Soviet leadership. The Soviet government welcomed the overthrow of Cuban president Fulgencio Batista by Fidel Castro's pro-communist rebels in 1959. Khrushchev realized the potential for a Soviet ally in the Caribbean, dispatching Mikoyan as one of the top diplomats in the region. He was the first Soviet official to visit the island country after the revolution, securing important trade agreements with the government including the export of oil from the Soviet Union in exchange for Cuban sugar. His trip to Cuba also reminded him of his early childhood and Mikoyan "fell in love with the revolution over there." During the Cuban Missile Crisis, Mikoyan was sent to Cuba where he persuaded Castro to remove the nuclear missiles and bombers provided by the Soviet Union. It was during negotiations with Castro in Cuba where Mikoyan was informed about the untimely death of his wife, Anush, in Moscow. Khrushchev's liberalization of hard-line polices led to an improvement in relations with the United States during the late 1950s. As Khrushchev's primary ambassador, Mikoyan visited the United States several times, inspecting the country's capitalist-based economic system in contrast to the Soviet Union's. Despite the volatility between the two superpowers during the Cold War, Mikoyan was received amiably by Americans, including Minnesota Democrat Hubert Humphrey, who characterized him as someone who showed a "flexibility of attitude" and New York governor Averell Harriman, who described him as a "less rigid" Soviet politician than his predecessors. His visits in the United States also included luncheons with Senators from the Senate Foreign Relations Committee and with United States President Dwight D. Eisenhower. Time Magazine repeatedly referred to him as the Soviet Union's "traveling salesman." He is widely credited for introducing many popular American foods in the Soviet Union including corn flakes, popcorn, tomato juice, grapefruit, corn on the cob, and frozen food. His importance and stature was gauged from his attendance at the funeral of U.S. President John F. Kennedy in 1963, representing the Soviet Union, reassuring President Lyndon Johnson that the Soviet Union had nothing to do with the assassination despite the involvement of Lee Harvey Oswald. Oswald had briefly defected to the Soviet Union before his involvement in the assassination of Kennedy. It is claimed by some that by 1964, he had become convinced that Khrushchev had turned into a liability to the Party, and he was involved in the October 1964 coup that brought Leonid Brezhnev to power. However, Taubman disputes this and Mikoyan was the only member of the Presidium (the name for the Politburo at this time) to defend Khrushchev. Mikoyan, however, did vote to force Khrushchev's retirement (so as in traditional Soviet style to make the vote unanimous). He was the only one of Khrushchev's colleagues to wish him well in his retirement, though he never spoke to him again. Mikoyan laid a wreath and sent a letter of condolence at Khrushchev's funeral in 1971. His influence was retained under Brezhnev as Mikoyan was appointed Chairman of the Presidium of the Supreme Soviet from 1964 until 1965, when he retired. He died on October 21, 1978, at the age of 82 from natural causes and was buried at Novodevichy Cemetery in Russia. During his tenure under Nikita Khrushchev, Mikoyan was the second most powerful man in the Soviet Union. He rose to power under Stalin and served as the People's Commissar for External and Internal Trade and as vice-president of the Council of Ministers under Stalin. However, it is his role in helping Khrushchev outmaneuver his rivals and in arranging for the Secret Speech at the 20th Party Congress that is Mikoyan's real legacy. Ironically, it was his later vote to remove Khrushchev from his post as Party Chairman in 1964 that served as his other most memorable action. Some have suggested that he had become concerned that the erratic Khrushchev had become a liability, although this has been disputed. Because unanimity was the accepted norm for Party votes, it is possible that his vote was for the sake of party unity. Mikoyan received a total of six commendations of the Order of Lenin. His brother, Artem Ivanovich Mikoyan, was the co-founder and one of the primary designers of the Soviet MiG military aircraft. **Not considered as head of state because the post President had been established. ↑ 1.0 1.1 1.2 1.3 1.4 Time Incorporated, Russia's Mikoyan: The Survivor, Time Magazine, September 16, 1957. Retrieved January 19, 2009. ↑ 2.0 2.1 2.2 2.3 2.4 Viktor Hambardzumyan, et al., Anastas Hovhannesi Mikoyan (Անաստաս Հովհաննեսի Միկոյան), Soviet Armenian Encyclopedia, Vol. 7 (Yerevan, Armenian SSR, 1981), 542. ↑ Martin MacCauley, Who's Who in Russia Since 1900 (London: Routledge, 1997, ISBN 0-415-13898-1), 144. ↑ Nikita Khrushchev, Khrushchev Remembers (Little Brown & Company, 1970, ISBN 0-316-83140-9). ↑ 5.0 5.1 (Russian)The Great Soviet Encyclopedia Online edition. ↑ Time Incorporated, Milestones. Retrieved January 19, 2009. ↑ Csaba Békés, Malcolm Byrne, M. János Rainer, The 1956 Hungarian Revolution: A History in Documents (Budapest: Central European University Press, 2003, ISBN 963-9241-66-0). ↑ William Taubman, Khrushchev: The Man and His Era (New York: W. W. Norton & Company, ISBN 0-393-32484-2). ↑ Walter Laqueur, Russia and Germany: A Century of Conflict (Transaction Publishers, 1990, ISBN 0887383491). ↑ PBS, American Experience: Fidel Castro, Castro and the Cold War. Retrieved January 19, 2009. ↑ MacCauley, Who's Who in Russia, 144. ↑ Adam Bruno Ulam, Stalin: The Man and His Era (Boston: Beacon Press, 1987, ISBN 0-8070-7005-X). ↑ 13.0 13.1 Time Incorporated, Down to Hard Cases, Time Magazine. Retrieved January 19, 2009. ↑ 14.0 14.1 New York Times, Anastas Mikoyan, Former Soviet Union president helped Krushchev stay in power. Retrieved January 19, 2009. ↑ Nikita Khrushchev, Memoirs of Nikita Khrushchev, Volume 2: Reformer, 1945-1964, Translated by George Shriver (Penn State Press, 2006, ISBN 0271023325). Békés, Csaba, Malcolm Byrne, M. János Rainer. The 1956 Hungarian Revolution: A History in Documents. Budapest: Central European University Press, 2003. ISBN 963-9241-66-0. Khrushchev, Nikita. Memoirs of Nikita Khrushchev, Volume 2: Reformer, 1945-1964. Translated by George Shriver. Penn State Press, 2006. ISBN 0271023325. Laqueur, Walter. Russia and Germany: A Century of Conflict. Transaction Publishers, 1990. ISBN 0887383491. MacCauley, Martin. Who's Who in Russia Since 1900. London: Routledge, 1997. ISBN 0-415-13898-1. Mikoyan, Anastas Ivanovich, Sergo Mikoyaned (ed). Memoirs of Anastas Mikoyan: The Path of Struggle, Vol 1. Sphinx Press, 1998. ISBN 0-943071-04-6. Mikoyan, Stepan Anastasovich. Memoirs Of Military Test-Flying And Life With The Kremlin's Elite. Airlife Publishing Ltd., 1999. ISBN 1-85310-916-9. Ulam, Adam Bruno. Stalin: The Man and His Era. Boston: Beacon Press, 1987. ISBN 0-8070-7005-X. This page was last modified on 19 March 2016, at 15:30.